Mercury – the solar system’s innermost planet – goes unnoticed by most people, because it’s so often obscured by the sun’s glare. Even when Mercury is visible – like it is now – it takes a deliberate effort to catch this rather elusive world. This evening, Mercury reaches its greatest angular distance east of the sun. What this means is that Mercury sets a maximum time after sunset today, enabling you to spot this planet at dusk and early evening. What’s more, Mercury shines close to the dazzling planet Venus, the 3rd brightest celestial body to light up the heavens after the sun and the moon. 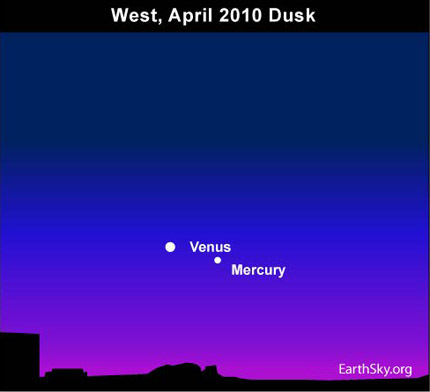 If you can’t see Mercury with the unaided eye, look at Venus through binoculars to spot Mercury, the sun-hugging planet. Mercury and Venus cozy up close enough together on the sky’s dome to fit within a single binocular field of view. If you have clear skies and an unobstructed horizon in the direction of sunset, your window of opportunity for spotting Mercury and Venus together is from about 40 to 90 minutes after sundown. After this evening, Mercury will start to fall back toward the sun. Day by day, Mercury will set sooner after sunset and its luster will fade. 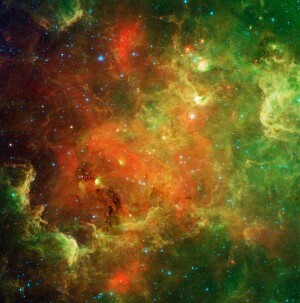 Catch Mercury now, while the opportunity still abounds!